Having been in the marketing business for many years, we have seen many lead generation efforts make it or break it based on the quality of the client’s data. Clients often have multiple databases in a variety of formats, incomplete data, and inaccurate data. There are some things that can be performed on the data with minimal effort like data appending and National Change of Address updates (NCOA), but that is not going to fix the fundamental problem. The real issue is that these clients are missing a data management system. They do not have one system that can span across both marketing and sales activities. They do not have the ability to capture contact, company or industry intelligence. And, they do not have a process for keeping information updated continually. Therefore, marketing and sales are often not on the same page. It is difficult to have successful lead generation efforts without an alignment of intelligence and internal resources. 83% for overall record completeness. It is challenging to deliver a successful lead generation program when you do not have the right contacts, emails or phone numbers. And, even more difficult to pass the information along to sales for further engagement. Interested in a B2B Marketing Data Evaluation? Are you interested in learning how managing your database accuracy can give your pipeline a Big Boost? Get in touch with the experts at ResponsePoint. We’d be happy to give you a free 15-minute phone consultation and answer any questions you may have. Analytics is on the rise. 70% of marketers use or plan to use analytics to drive market prioritization, Account-Based Marketing (ABM), and more meaningful segmentation and targeting. Analytics can be the key to a successful lead generation campaign, as you are to perform intelligent targeting, strategic profiling, audience optimization, and lead scoring to find the perfect target. But before any of this analytical modeling can be done, the data has to be clean and accurate. If the data is not complete, accurate, and timely, then the resulting output is unreliable and of no useful value. You lose any competitive edge that you thought your data would provide. 40% of marketers don’t feel as though their sales teams have the right account intelligence to engage with prospects. To have any sales acceleration, the flow of accurate information between sales and marketing needs to be expedited. However, 69% of companies do not currently have connected data across their Customer Relationship Management (CRM) and marketing automation platforms (MAP). And, 49% of marketers currently do not perform any lead scoring to prioritize leads. Based on the Dunn & Bradstreet research, integrating systems and scoring leads can reduce buying cycles by 10 -12 days. As indicated by the research, managing your database accuracy and intelligence can help you better understand your pipeline, as well as target individuals with the right type of information to move them through the buying process. If you know your customer, you will know how to speak to them and you will know how to sell to them. 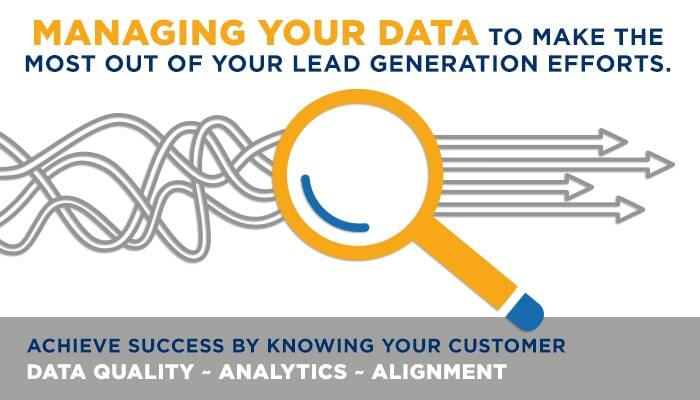 Focus on your data to make the most out of your lead generation efforts and motivate your customers to purchase. Next STEPS FOR YOUR DATA?